If you wrote a post on this or any of my other discussion topics today, Tuesday June 26th please leave your link in the Mr. Linky before midnight Central time (US) and you will be eligible to win a prize. Like regular book reviews, what is included in audiobook reviews varies from person to person. Some people, for instance, include release date and page number or audiobook length in their reviews. I am personally less interested in that information, so I don’t include it. I do like to know information about the publishers, both print and audio, because I find it tells me quite a lot about the book or audiobook, so I include imprint and publisher information for print editions, and for audiobooks I include all of this information, plus information on who published the audiobook. These pieces of information are definitely personal, and reasonable people can absolutely disagree on what should be included. What I think is non-negotiable in an audiobook review, though, is some sort of information about the narrator and/or production. Who was the narrator? Did he or she fit the story? Were there studio noises that distracted you? Did the narration pull you farther into the story? There are two reasons that this sort of information is important. First of all, other people who are considering the audiobook will want to know if the narrator and production were any good. The other reason is that an audio production can seriously influence how you feel about a book. An amazing production can elevate a mediocre book and a bad production can keep you from enjoying a great book. Even the people reading your review who will never listen to an audiobook need to know what you thought about the production, so that they can assess how the production influenced how you felt about the book itself. Candace from Beth Fish Reads also has a great post about How to Write an Audiobook Review that you should check out if you feel that you need more pointers, or check out the responses of some of your fellow bloggers below. Thanks so much for mentioning my post. I was thinking how I didn’t really have anything new to add. Your post really covers just about everything! It is okay if you don’t comment, Autumn, as long as they’re on the Linky! Great topic! I linked my review but I will write on the topic later today and re-link. Something I’ve added to my reviews is the difficulty level of listening. Some books aren’t easy to follow in audio ie when the plot is complex or too many points of view or jumps in place and time. I thought newer listeners might benefit from that information. I don’t necessarily do that with every book, but it is something I will mention if a book is difficult, I do think it is helpful. I love this topic, and can’t wait to see everyone’s posts! I completely agree that production can make or ruin an audiobook. I usually mention wether I’d recommend the physical book over the audio, or vice versa.Here’s Audiobook Review Essentials post! I agree. It’s so strange when I see an audiobook review that doesn’t talk about the narrator or production. The narration certainly can make or break the audiobook so I agree that’s the most important point to address in any audiobook review. Thank you for this discussion topic! As a narrator, reviews can give me such important information – bits I can use to really hone my performance and deliver something even better the next time around. This is such a good topic. I always struggle when it comes to writing my audio book reviews. I’m never quite sure what I should include. I do always list the narrator and I indicate in the title of the post that it’s an audio book. Thanks for stopping by my blog today and thanks for your suggestions! You make a great point about how audiobooks can impact your views on the story. It is so very true. When reading mediocre print reviews about a book I’ve been interested, I’m apt to check out who narrated the audiobook. If the narrator is great, I might still give it a try. Forgot to link up earlier in the day! Thanks for the link for the article on how to write audiobook reviews … I’ll have to check it out! I agree that production is a HUGE thing that should be commented on in reviews. I’ve read a few reviews where people listen to the audio, but don’t say ANYTHING about it … how were the narrators? The production? The difference between listening to the audio and reading the book? I want to know! I never thought about the fact that people might want to know how the narrator affected my impression of the book. That’s a really valid point! I posted this yesterday, but have been on vacation in the Bahamas and forgot to update! I spent all day yesterday in a train/bus traveling from Anaheim to San Jose and was too tired to link last night. Tonight I am watching the sun set over the Pacific Ocean in Crescent City, CA. Don’t want to have an audiobook in the ears because the ocean sounds so lovely. wow! 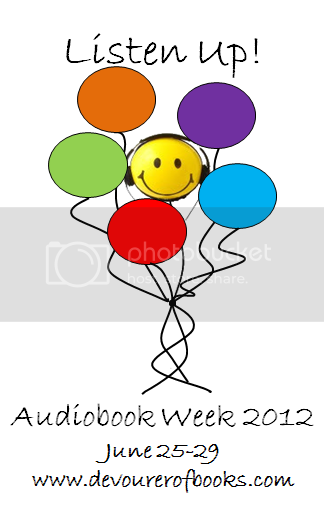 as a narrator, it is so gratifying to hear about all of your processes as reviewers and about your love of audiobooks! reviews are so subjective and can lift us up and smash us down. there was a very amusing thread recently on FB wherein we narrators posted some of our worst review snippets. allowed us all to laugh a little at the absurdity of some of them! but a professional, well thought out and thorough review helps us grow, even if negative and i, for one, am grateful for the time taken to inform. while i understand how the book and narrator can become inexorably linked, i think it is important to not drag the narrator down just because the book is not well written. this happens a lot with “listener” reviews and it shows a lack of understanding of the process. i thank you all for separating the two! This is a great point, Hillary! That’s exactly why I put separate sections for the story and for the audio production in my reviews. I don’t want to pull a good narrator down with a bad story any more than I want to pull a good story down with a bad narrator.